Mrs. Hufnagel takes issue with the billing practices at St. Eligius, but pays her bill nonetheless. enthusiast Tony Clifton (John Corey). The fifteenth installment of the continuing adventures of St. Eligius's most difficult patient, from the episode "Any Portrait in a Storm", begins with an introduction to happy-go-lucky telephone installer Tony Clifton (John Corey), who is using gerbils to run cable through St. Eligius's ducts. He draws the ire of short-tempered ward nurse Lucy Papandrao (Jennifer Savidge), then informs her that one of his rodent employees is missing. I've also left in one of St. Elsewhere's greatest meta gags. Orderly Warren Coolidge (Byron Stewart) moved from Los Angeles to Boston to play college basketball, but he blew out his knee and ended up working at St. Eligius. Television viewers first knew Warren when he was a star high school player on the CBS drama, The White Shadow (1978-81), an MTM production created by St. Elsewhere executive producer Bruce Paltrow. 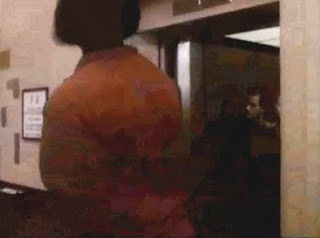 Timothy Van Patten played teammate Mario "Salami" Pettrino, so when Warren sees Dean, the drug dealer/hustler boyfriend of a coke-addicted pregnant fourteen-year-old, who happens to be played by Van Patten, he thinks he's seeing his fellow Carver High alum and calls out to him.. Dean replies, "you've got the wrong guy, pal." Warren stands confused for a moment, then walks away singing "Purple Haze" to himself: "things they don't seem the same." old Carver High teammate (Timothy Van Patten). 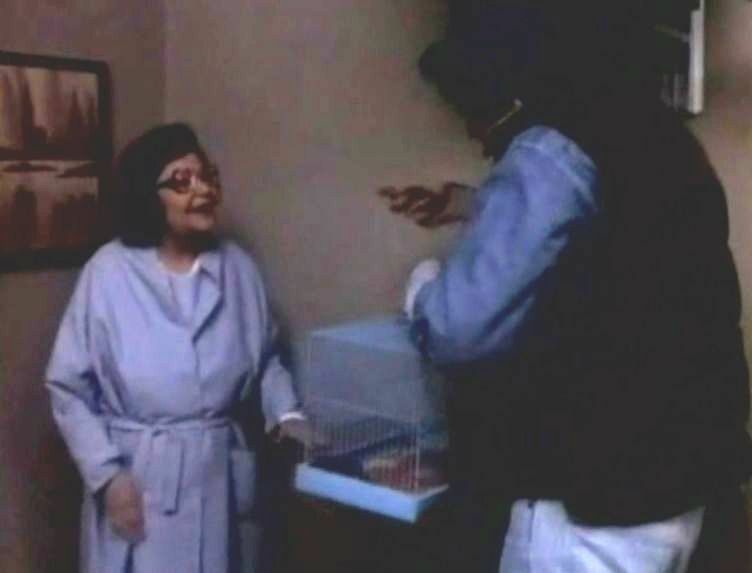 Mrs. Hufnagel is once again keeping herself occupied with her ham radio when Clifton's runaway employee ends up in her room, and the two hit it off over their shared enthusiasm for gerbils (Tony's are named Ike and Tina). Nurse Papandrao arrives with an IV ordered by Dr. Chandler, and Hufnagel has taken it upon herself to monitor the hospital's charges, having already run up quite a few bills in her previous visits. Papandrao explains that she doesn't need to do that--the hospital tracks billable expenses by placing stickers on a chart on the back of the door. The enlightened patient then takes it upon herself to do some creative accounting. Later, we rejoin Mrs. Hufnagel in the hospital's financial department, where she has kept a beleaguered administrator long past the end of her shift by refusing to pay charges for items she doesn't feel justified paying for. Chief of Services Dr. Daniel Auschlander (Norman Lloyd) arrives to settle the dispute. 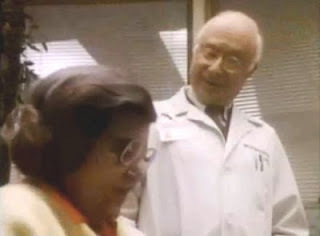 After calling Auschlander "Jeeves," she once again demonstrates her uncanny ability to hit someone where it hurts when she recognizes him as the guy whose portrait in the "rogues gallery" (actually, the hospital's chapel, where his portrait will be hung next to that of Father McCabe, the hospital's founder, hence the title of the episode) made him look like "death warmed over." Auschlander had been in a particularly cranky mood over the idea and process of having his portrait painted. Benjamins as Mrs. Hufnagel pays her bill. She asks him why she has to pay for things like surgical gloves (which she doesn't even wear) and rubbing alcohol (for that kind of money, they could have used Chivas). Auschlander inquires about her payment options, and we learn that Hufnagel doesn't believe in medical insurance, and when he asks about Medicare, she replies, "A senior citizen with the big C and you're beatng the drum for Medicare? Doesn't cover diddly-squat." But for all her haggling over the bill, we find out that it's not because she can't afford it. Quite the contrary--her father sold short before the Great Depression, and she's got enough to cover her costs...in cash. The look on Norman Lloyd's face as he counts out the hundreds along with her is hilarious. The callsign Mrs. Hufnagel uses here is Kilo-Alpha-Six-Zulu-Golf-Bravo, or KA6ZGB. You can hear the voice on the radio say "El Salvador." Last time, in "Give the Boy a Hand", she called, "come in, KA6ZGZ." That was the callsign for her compadre in Puerto Rico. The last few letters of a callsign in amateur radio are unique to operators, while the letters at the beginning indicate location. This is a great episode for commentary on health care costs. Edward Copeland assembled an excellent video essay on St. Elsewhere's treatment of money in medicine in his 30th anniversary retrospective at PressPlay. The use of the name "Tony Clifton" is a tribute to the recently departed Andy Kaufman (who died of cancer in 1984).